A Brown Solutions support representative might ask you to run Brown Solutions TeamViewer QuickSupport software in order to access your computer. This is done to help troubleshoot a possible issue that you may have. Brown Solutions respects your privacy, and no confidential or sensitive data is viewed or gathered. No software will be installed on your computer. Remote access to your computer will not be possible after you close the software. 1.) Download Brown Solutions Teamviewer QuickSupport below, and run the downloaded file. The link will automatically direct you to the correct software for your platform (Windows, Mac, Linux, Android or iOS). 2.) 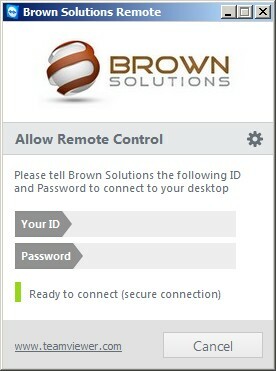 Provide your ID and the randomly generated password to Brown Solutions support engineer. Contact our Sales for TeamViewer license enqueries.